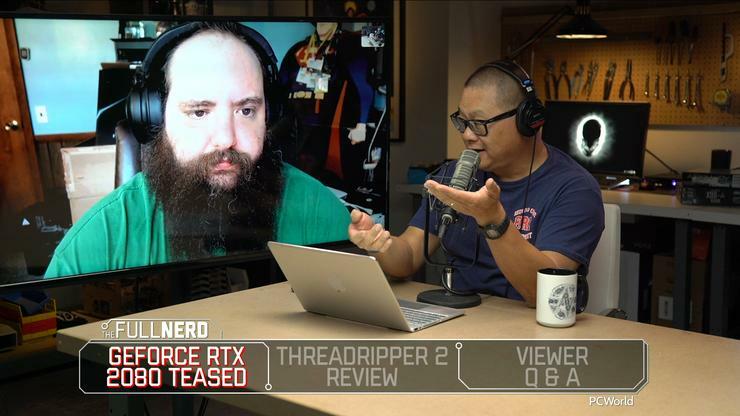 In this episode of the Full Nerd, Gordon Mah Ung, Brad Chacos, and Adam Patrick Murray geek out over a monstrous new class of desktop processor and the future of graphics cards…which could arrive in less than a week! Yes, Nvidia formally unveiled its Turing GPU and Quadro RTX hardware this week, and they provide a glimpse of what PC gamers can expect in the next generation of GeForce graphics cards. We won’t need to wait long, it seems. Not-so-cryptic secrets in a recent Nvidia video strongly hint that the GeForce RTX 2080 will launch next week at Gamescom. You read that right: RTX not GTX. R is for raytracing! We dig into the specs revealed so far. After weeks of unboxings and exclusive interviews with AMD’s computing chief, the beastly 32-core Threadripper 2990WX ($1799 on Amazon) has finally hit the streets. And as Gordon puts it, “For those of us who actually do push pixels around for a living, this new 32-core Ryzen Threadripper is Thor’s hammer falling right into your hands with a crackle of lightning and thunder.” But do you need it? Find out as we discuss the findings from Gordon’s Threadripper 2990WX review. Witness it all in the video embedded above. You can also watch The Full Nerd episode 63 on YouTube (toss us a follow while you’re there!) or listen to it on Soundcloud if you prefer the audio alone.